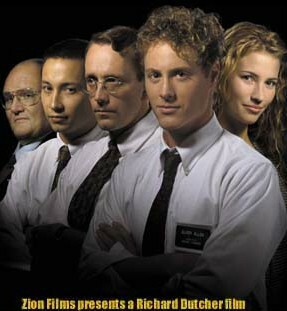 God's Army was the movie that unleashed a flood of other LDS films into the popular media. Richard Dutcher wrote, produced, directed, and stared in this movie that tells the story of an LDS mission in Los Angeles, CA. Elder Allen (Matthew Brown) is not quite sure why he came on his mission. His stepfather, who brought him into the LDS Church, is serving a prison term for child molesting, and Allen's mom is leaving the LDS Church. He gets teamed up with Elder Dalton (Dutcher), who goes by the name "Pops" since he's quite a bit older for a missionary (a 29-year-old). Pops is quite instrumental in not just showing Allen the ropes of the mission, but in becoming a responsible young man, and more importantly, in knowing the truth of his religious faith and the power to be used of the Spirit. Through all the trials and perseverance, Allen is rewarded with many blessings--conviction, bringing people into the LDS Church, and even a wife when it's all over. What was so interesting for me about this movie was its brutal honesty. Yes, this was a faith-promoting tool for the LDS Church. But nonetheless, this flick broke the stereotypes of LDS films never wanting to even admit there are any problems with their faith. No faith (even Christianity) is immune from problems, and Dutcher should be commended for simply acknowledging some problems with his own faith. Now of course the way these problems are dealt with is somewhat troubling, but at least they're put out on the table for others to think about. Besides acknowledging the somewhat trivial fact that occasionally LDS do some really "bad" things (like Allen's folks), God's Army shows that sometimes individuals apostatize after coming into contact with "anti-Mormon" literature. One of the other elders on Allen's mission, Elder Kinegar (Michael Buster), actually leaves the mission as a result of reading this literature. The film even goes so far to have Kinegar state a couple problems: 1. The Book of Mormon cites horses being in America prior to the time of Columbus, but Kinegar says that it's pretty much an historical fact that this was not the case. 2. There were four different accounts of Joseph Smith's First Vision account (for more on this problem, see Dean C. Jesse, "The Early Accounts of Joseph Smith's First Vision", Brigham Young University Studies IX, 3 [Spring 1969]: 275-94). Another problem that the film deals with concerns the controversy concerning priesthood--both for blacks as well as women. Allen goes with Elder Banks (a black missionary played by DeSean Terry) to talk with a black couple about the LDS faith. The couple is quite bothered that the LDS Church just allowed blacks to hold the priesthood in 1978. They were also troubled that the LDS Church does not allow women to hold the priesthood. Banks attempts to solve the problem with an analogy of the Old Testament priesthood being given simply to Israelite men, and then in the New Testament it was given to the Gentiles. He claims it is God's to do with as He pleases. Evidently, Banks wasn't too satisfied with this explanation, since afterwards he confides to Allen how upset he is over the issue. Banks shares his emotional conversion story with Allen, and how he came to know the LDS is true. Then Banks tells Allen, "It's like God gives you 100 reasons to believe, and then He gives you 1 or 2 problems to see if you really want to believe" (paraphrase). But to the outsider, it appears more like LDS get 1 or 2 reasons to believe, and then God gives them 100 problems. So what's one to do? Of course by asking God directly and receiving the "burning in the bosom," one realizes that religious faith and commitment is primarily a thing of the heart and not the mind. But does this really settle the problem? It certainly does for LDS at least. Finally, for more reviews and information on God's Army, click here.